Bartender has become one of those apps that I can’t imagine being without. I know some people are fanatical about not running Menu Bar icons, but I find that a lot of the apps I depend on use them. Bartender is a great way to keep them all out of sight unless I need them. 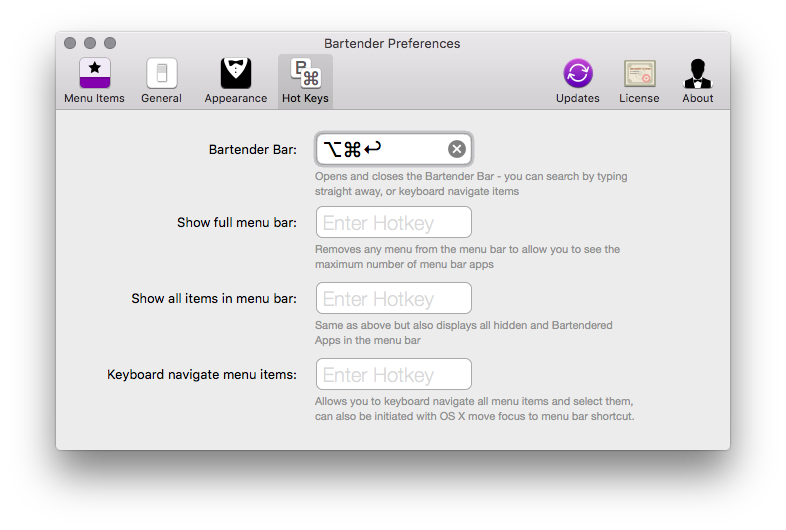 While Bartender really only does one thing well, it features a really powerful Preferences section, which includes the handy ability to set your own keyboard hot keys. I find this extremely useful when I need to check a Menu Bar item that I don’t normally display on the full Menu Bar. Personally, I use Command–Option–Enter for this. To set your own hot key, click the Bartender menu bar item, and click the gear icon in the far right. In the drop-down menu, click Preferences. In the Bartender Preferences window, go to the Hot Keys tab and enter a shortcut in the Bartender Bar field. After you’re done, you can close the window and try out the new shortcut. This is a great to way to quickly check on your Menu Bar items without taking your hands off the keyboard.